A couple of days before, I was reading local newspaper mentioning major downfall in textile industry. It was a huge loss to Pakistan’s economy. Textile downfall Pakistan aimed more than 30 Textile Mills to shut down totally & more than 50 reduced their working hours from 24 to 16 and 8 hours only. There are lots of Crisis our Industries are facing like Electricity, Gas, Subsidies, Raw Material and so on. 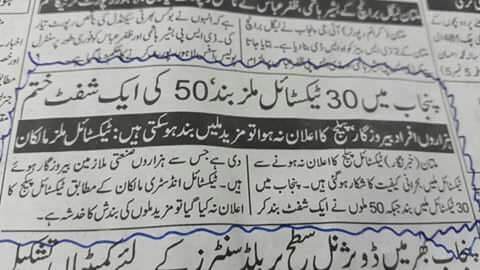 Yet #Industrialist are trying to run their #Unit as thousands of workers, managers, and #Industry related Businessman are attached. Textile downfall Pakistan 2015 has reduced a much of market demand from both segments that are hard to manage for small-scale businesses & especially for #workers and #Staff. Govt. policies are toward supporting industries but what industrialist will do if there’s shortfall of basic need energy to run machine. This is the case with every market that directly or indirectly related to textile industries like Electrical, Electronics, Metals, Bearings, Wood, Stationary, Computing, Packages, Transporters, Constructors, Chemicals and other manufacturers and suppliers. A trader friend was talking to me yesterday that he hasn’t seen such Textile Downfall Pakistan his 14 years of business life, still there is a hope and try to boost industries with words like “Next Month” it shall be better. What daily wage workers will they do unless industries rise? Still A question mark ! Other industries are also struggling to manage crises but they are not in media, Textile always get credit because of being backbone in Economic growth in Pakistan. I personally remember when my father introduced Spindle Tape to mills, there was a great demand of belts like Timing Belts, Transmission Belts, Blower Tape, Conveyor Belts & Vee Belts. But today, every industry trying to stop purchases to the maximum level. They try to reuse the same thing after repair. If they purchase new, either give you no profit or delay it as much as they could. Remain industries are also effected with this downfall. As textile has been Pakistan’s backbone and played vital role in growth. Most of the companies export their textile products to Europe, America & Arabia. Revenues generated from these exports makes our country strong. Paper Mills, Cement, Pharma, Packaging are also disturbed because of major reduce in exports. spinning mill uses paper cones. It will shut down those manufacturers who make it to supply. Packaging industries make bags, Print their tags, other packing related items. It’s a circle. Yeah. I was wondering. Pakistan has a good repute in Textile. Why its still going down? Solution is only available when Govt & Industrialists start doing effort together. Lots of people in Pakistan are afraid of doing Business Registration instead of Enjoying Benefits of Business Registration.